Doing this birthday post really tells me I need to get to my parents' house and scan my childhood photos so I don't have to use the same picture every year. 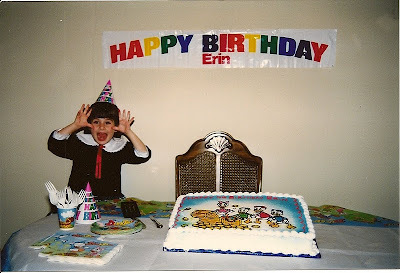 I was stoked at 4 years old with my Ducktales party and of course, upon receiving Webby. My parents even surprised me with my preschool teacher, Miss Beauxay (no idea how to spell, it was pronounced Boo-ay) at the shindig. Subsequently, they also tried to set her up with my uncle. Who knew 4th birthdays had match.com moments? I am going out to lunch with my dear friend Courtney and tonight I'm making a Greek-inspired dinner with my husband and bff complete with baklava and of course cake balls from my favorite bakery, Patty's Cakes. Feels like the perfect way to greet this new year, which is feeling ridiculously far from 20 and all too near to 30.